Santa Fe Railyard Plaza tilt-shift drone capture by Stephen Guerin. Composite image by Laura Egley Taylor. The first annual InterPlanetary Festival will draw space enthusiasts from around the world for a two-day celebration of human ingenuity June 7-8, 2018, in Santa Fe, NM. The festival will transform the Railyard District in downtown Santa Fe with an expo showcasing innovation and technology for space exploration. Concurrent with the expo, participants can enjoy open-air concerts, maker spaces, lectures, panel discussions, food, beer, and citizen science projects and games centered around InterPlanetary topics. "This is a festival where we’re asking people to come and have fun, but also to contribute towards a global challenge of becoming an InterPlanetary civilization,” says SFI President David Krakauer. As a global destination for both the arts and sciences, Santa Fe is the ideal location for a festival that celebrates innovation across these domains. The InterPlanetary Festival coincides with the opening of the CURRENTS New Media art installation and the inaugural Nation of Makers Conference (NOMCON) in Santa Fe. "The arts — visual arts, cinematic, literary, musical — expand our imaginations and they explore territories that we don't even know exist. I've always felt that science wouldn't function without the arts." Art, he says, plays a critical role in the InterPlanetary Project. "We now as researchers need to reach out to a broader base in order to address complex issues such as resource use, economic inequality, and climate change," Krakauer says. "One way to bring people together is to make the science interesting and very aspirational. Posing an InterPlanetary challenge brings all of the best minds to the table, and also has the virtue of potentially producing an InterPlanetary civilization." Read additional information about the scope of the Project. 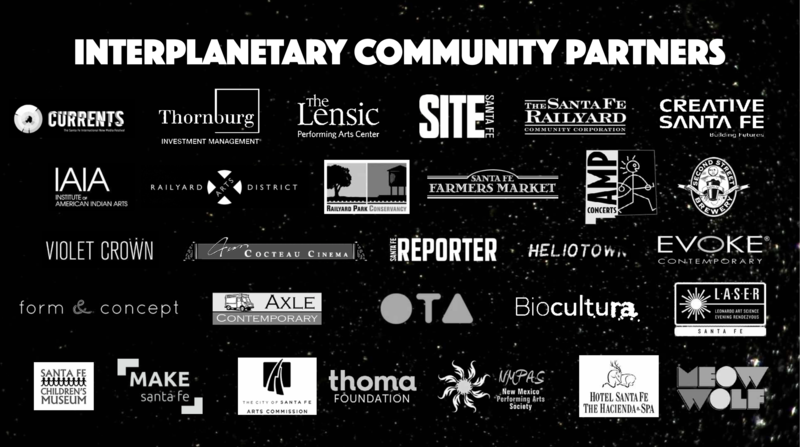 The InterPlanetary Project is a collaboration between the Santa Fe Institute city-wide partners, including Currents New Media, MAKE Santa Fe, SITE Santa Fe, Jean Cocteau Cinema, Violet Crown Cinema, The Center for Contemporary Arts, The Santa Fe Children's Museum, Creative Santa Fe, The Railyard Community Corporation, The Screen at SFUAD, The Lensic Performing Arts Center, Thornburg Investment Management, Form & Concept Gallery, BioCultura, OTA Contemporary, EVOKE Contemporary, Second Street Brewery, and many others.